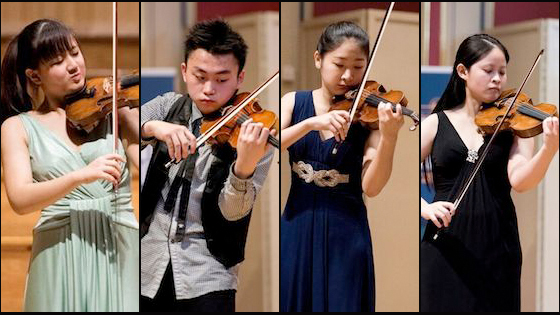 April 13, 2016, 9:42 AM · Congratulations to the Senior Finalists in the 2016 Menuhin Competition in London! L-R: SongHa Choi, Ziyu He, Jeein Kim and Yu-Ting Chen. Click here to watch the remaining live stream for the Junior Finals and archive performances. The Senior Finals will take place Saturday at Royal Festival Hall in London and will not be live-streamed. Finalists will play Lalo Symphonie espagnole in D minor, Op. 21; Mendelssohn Violin Concerto in E minor, Op. 64; Prokofiev Violin Concerto No. 1 in D, Op. 19 and Dvorák Violin Concerto in A minor, Op. 53, with the Royal Academy of Music Symphony Orchestra, conducted by Christopher Warren-Green. The Prize-Winners will be announced at the end of the evening. Jury members for the 2016 competition are Pamela Frank (chair), Joji Hattori, Ray Chen, Martin Engstroem, Ning Feng, Don-Suk Kang, Tasmin Little, Julia Fischer and Jeremy Menuhin.